In 2018, the first night of Hanukkah is Sunday, Dec. 2. In 2018, Hanukkah begins at sundown on Sunday, Dec. 2 and lasts until sundown on Monday, Dec. 10. 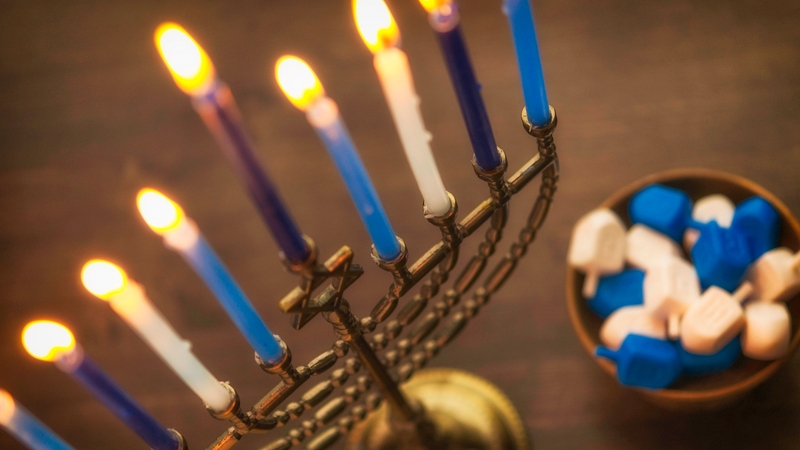 Find a Hanukkah checklist here. We celebrate Hanukkah at home by lighting the menorah (each night we light one additional candle to the number from the previous night), playing dreidel, and eating special foods unique to Hanukkah. Some people also sing Hanukkah songs or exchange gifts after lighting the menorah, which is also called a hanukkiah. Many people host and attend Hanukkah parties. Many Hanukkah foods are deep-fried in oil, symbolizing the oil from the menorah used in the Temple. These include latkes, or potato pancakes, and jelly doughnuts. Other favorites include the Sephardic delicacy bimuelos and use, of course, applesauce as a latke topping. Chocolate gelt, a candy that gets its name from the Yiddish word for money, is another popular Hanukkah treat. Your guide to lighting the candles and more.